1. Preheat the oven the 180°C, gas mark 4. Place the mushrooms on a baking tray. 2. Mix the stuffing ingredients together and season. 3. Stuff the mix into the mushrooms, sprinkling any extra around the mushrooms on the tray. 4. 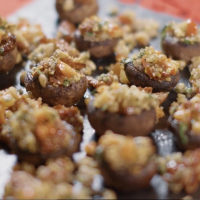 Place in the oven and bake for 15-20 minutes, until the mushrooms are soft and delicious. This recipe was first published in Wed Nov 19 16:57:00 GMT 2014.